Thanks to Jonny for getting the information from the developers! Green Lantern was going to be an action/platform game by Ocean based on the DC comic character. The game was apparently finished. It was shown at the Winter 1995 CES. Green lantern was an interesting one as I was only on the game for the first few weeks before moving of to work on Jurassic Park 2. It kinda went through development hell (new programmers coming on to finish it as the original guys were fired). I do know an original finished version of the game exists, in binary format, although I've since lost contact with the guys who written it. Initially Green Lantern was coded by Andrew Deacin, but was taken over and rewritten by Bobby Earl. Green Lantern was a project I worked on quite a few years ago, for the Super Nintendo. The project was in fact finished, but DC Comics wanted some very difficult and arduous changes to the product, thus considering the budget already spent, Ocean Software deemed it was not worth continuing with the project. 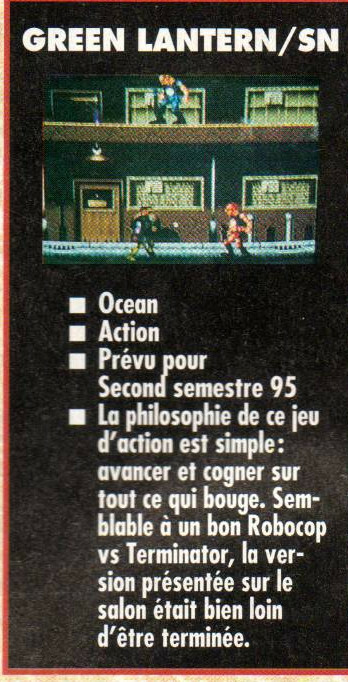 Preview in the February 1995 issue of Joypad (a French magazine). Courtesy of ljlkunio. Music composer Dean Evans posted some songs from the soundtrack on his Youtube channel. He says some were reused in Waterworld. Really, the music is quite awesome.